I haven't really thought about prizes, but I have a bunch of extra steam keys I could give away maybe? Honestly, it's more about the fun of writing the stories, but if there's enough interest I'll put up some Steam keys and make a poll at the end to determine the winner. Hell yeah I'll write a fic! ...She's in, what, seventh grade? Hes 11th. Its worse. But I guess that's the challenge...? Nothing saying it can't be post-Ohtori. I revived my TRULY ANCIENT ACCOUNT specifically to comment to this thread saying: yes, I ship it, and I support more content for it. I missed this the first time around. Personally, I'm just going to do the sane thing and assume people will either write post-series or not get into sexual territory. If someone does, they'll get rightfully shamed for it. If you have an objection to it beyond that, please also go tell the Utena (14) x Anthy (we don't know, most likely hundreds) crowd that you've figured out their ship is not okay, thanks. Like I know I'm being rude here, but come on now, you just side-eyed the entire fandom and implied we're all pedos. Next time please think about what you're saying before you say it. Here's the link to the tumblr post with the list of the games. I'm changing the due date to the 31st, so if you're writing, you have a few extra days. And I'll give out steam keys to the best two stories, not just one. Have fun, everyone! Still haven't gotten to writing yet, might as well soon... maybe? We'll see. ...Yes, I just side-eyed the entire fandom, which I am in, and implied it's all pedophiles. Absolutely. If you have an objection to it beyond that, please also go tell the Utena (14) x Anthy (we don't know, most likely hundreds) crowd that you've figured out their ship is not okay, thanks. 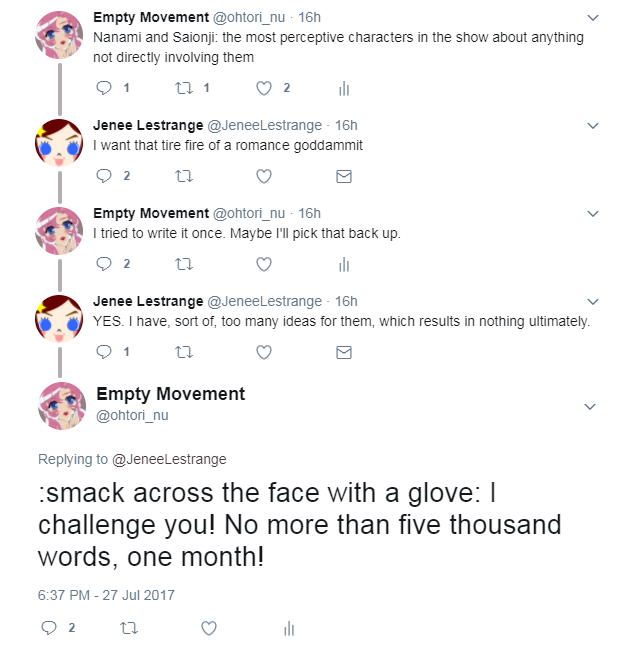 I was actually trying to avoid being harsh because we do all rely on this forum and I want to continue to work with the people here to make more Utena-related material accessible to the public in English (I was not going to comment on this thread anymore, for sure), and that is still my intention, but... that's a really bad comparison. If Anthy is hundreds of years old, it's in the same sense that Sailor Chibi Moon is hundreds of years old... she's certainly not meant to be viewed as "grown-up." When the creators talk about her, she's always referred to as a girl, not a woman; Utena and Anthy's relationship is described as being between two girls, so there's no reason to assume otherwise. Next time please think about what you're saying before you say it. Again, I want to make it clear I was not planning to take this any further because I realize I am not in charge here; I just can't ignore a comment like that. Hey cool, I'm taking this to PM. All right, we've got some fics up! I will make another post where you can vote on fics at the end of the day, once I'm sure I have all the fics in. Here's the link to the index. If you posted a fic and I don't have it listed there, please let me know so I can put it in. Good luck to everyone who entered too! Edit: Oh yeah you've got until Friday in case you haven't read the fics yet, and here's the tumblr post with all the entrants. Should we rename this thread for all the other shipping fic challenges in mind? Ah, awrighty then! Breaks are always nice, enjoy yours gurl!